The Grand Prix trophy will be staying in Canada, as Montreal native Robert Anderson took on all comers to win Toronto. 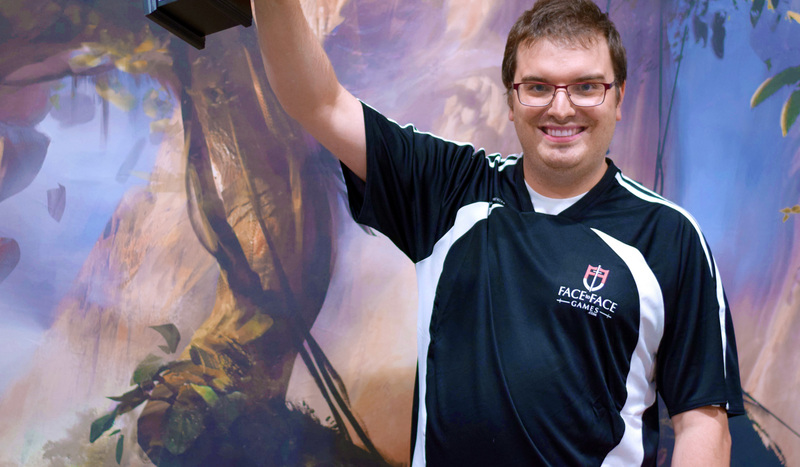 It began with more than 1,300 players, and it ended with Robert Anderson hoisting the trophy after an impressive Top 8 draft and a thrilling finals victory over Allen Sun, the native Canadian taking down the Grand Prix Toronto title in his home country. It was a wild weekend, with every match of the Top 8 going the full three games, a perfect representation of the tense and exciting games that Hour of Devastation brought to the Limited format. There were Cats, Gods and God-Pharaohs all over the room – and the Top 8 – this weekend, and it made for some thrilling matches. It was also a last chance for players to pick up much-needed Pro Points as the season-ending Pro Tour Hour of Devastation approaches next week in Kyoto. For Andrew Cuneo and Ben Weitz, it was a fruitful trip. Cuneo locked up Gold for the season with his Top 8 appearance, while Weitz’s trip to the semifinals put the same status in reach at the Pro Tour. But, in the end, it was Anderson who stood the tallest, taking a Green-White Exert deck the distance by knocking off Doug Potter in the quarterfinals, Matthew Nickolai in the semis and ultimately a determined Allen Sun in the finals. Congrats to Anderson, the winner of Grand Prix Toronto! It’s been a wild day here in Toronto, as more than 1,300 players turned out to give Hour of Devastation its first run through a Grand Prix. It’s been all cats, zombies, and gods in the trip back to a devastated Amonkhet, and it’s no surprise that the final undefeated match of the day came down to the Nicol Bolas, God-Pharaoh mirror. Winning that mirror was Andrew Noworaj, who is joined at the top by Ben Weitz – who is chasing a win to lock Gold for the year – as well Brendan McNamara, Abe Corrigan, and home crowd favorite Doug Potter, who is looking to repeat his Top 8 performance at the last GP Toronto. Nearly 400 players will be back to battle Sunday morning, with six rounds of Booster Draft to decide who advances to draft once more in the Top 8 of the tournament. It’s been a Bolas-filled day here in Toronto, and we’ll be back tomorrow for a little more of the God-Pharaoh.